The French, having started from zero, have jumped into boxing with both feet. […] Before long, a Frenchman will be champion of the world. This quote, attributed to legendary African-American boxer Sam McVea, serves as the epigraph for a curious-- and curiously prescient-- book written in 1911 by Georges Rozet, La Défense et illustration de la race française. In it, Rozet chronicles and promotes the new-found prowess of the French in various sports that had long been considered exclusively British endeavors. He seeks to reinforce nationalist pride in his countrymen’s burgeoning athletic skills and to underscore the cultural, political, even “racial” importance of this new phenomenon. Rozet’s choice of title, a perhaps (or perhaps not) tongue-in-cheek reworking of Du Bellay’s seminal text of the French poetic Renaissance Défense et illustration de la langue française (1549), is significant, suggesting at once his belief that a veritable “renaissance” of French identity will take place by way of athletic achievement. It also seems to suggest an idea he will make much more explicit slightly later, that literature will play a central role in that renaissance. There is no mention of the soon-to-be-great French boxer Georges Carpentier in the volume. This makes sense, given that the book was published in 1911 and that Carpentier didn’t win his first French title until June of that year and first European title several months later. Rozet’s comments about what French athletes are and should be nonetheless provide a virtual blueprint of what Carpentier will very soon become, in both pugilistic reality and popular perception. His extolling of quickness, endurance, intelligence, “grace,” “style” and “panache” as essentially French qualities almost eerily prefigure the adoring and essentialist descriptions of Carpentier that would fill both French and British newspapers in the months and years to come. A veritable myth of Carpentier would accrue, a myth that would endure long after his retirement from the ring. This myth, for all its hyperbole and hero-worship, had its basis in solid, pugilistic fact: Carpentier defeated British opponents with lightning speed and ferocious power, winning European championships in an unheard-of four different weight categories, up to and including heavyweight, in just a couple of years preceding World War I. He would regain the European heavyweight title soon after the war’s end and travel to America to win the world light heavyweight title, making him the first non-native speaker of English to hold a world title in boxing. Less than a year later, he would fight the legendary Jack Dempsey for the world heavyweight belt, in a fight that has gone down in the history books as boxing’s first million-dollar gate and a landmark in the history of the marketing of professional sports. Despite his loss, he emerged as a beloved global figure, everyone’s favorite adopted son. It is important to reiterate that Carpentier accomplished all of this while maintaining what was perceived as a quintessentially “French” persona and in this way, too, fulfilled Rozet’s hopes. Rozet’s argues that athletes are thinking, feeling human beings, as capable as anyone else both of experiencing and expressing emotion. When athletes do express their feelings, he says, “it is with a sensitivity that is youthful and somehow refreshed.” He thereby assures his readers, who may fear that sports will “impoverish” the traditional French socio-intellectual strengths of “grace and psychological subtlety,” that he knows many athletes who are “cultivated men of the world, who cry on occasion like children.” (7) Rozet is assuring his French readers that the new breed of French athletes are indeed, and will remain, “real” Frenchmen. They will represent not only muscle but also heart and head, as Frenchmen always have; they will not become the hulking, pre-verbal Anglo-Saxon brutes of collective French nightmares. Carpentier’s extreme popularity will indeed owe much to his ability to conform to popular notions of “Frenchness,” his ability to be “cultivated” and “graceful” while at the same time putting a string of apparently tougher British opponents on the canvas with no discernible difficulty. This passage too is difficult to read without being aware of how completely Carpentier ‘s career would, in the very near future, incarnate and transcend the ideas it expresses. Endlessly hailed as a “Greek god” (or at least a piece of Greek statuary), Carpentier would be admired for his physique as much as for his pugilism. His body would be strong and effective but also beautiful, “at once muscular and fine.” The French (and the British and Americans, for that matter) would indeed cultivate an “ instinctive and […] subconscious admiration of the human body” by way of Carpentier’s “pectorals and rhomboids […] roiling beneath a glistening epidermis.” And Rozet is absolutely right in thinking that this admiration for a beautiful—and highly skilled-- body would consistently attract an improbably distinguished crowd to ringside for Carpentier’s fights. Many card-carrying members of the aristocracy and the haute bourgeoisie, many prominent figures in all sort of prestigious fields, people who had never before even thought about boxing, would become avid fans of the slim and handsome young Frenchman with the devastating smile and even more devastating knockout punch. Rozet’s manifesto ends up, in effect, painting a portrait of the ideal French athlete of the future: strong, skillful, and beautiful, a standard-bearer who will be able to beat the British (and various other “Anglo-Saxons”) at their own game while remaining quintessentially French in personal style, appearance and manner. He did not know that his idealized athlete would in fact manifest himself in the flesh just a few short months later. He certainly could not have known that the imaginary portrait he had painted foreshadowed virtually every trope of the elaborate myth that would grow up around the young boxer. While Carpentier’s pugilistic feats were certainly very real, and genuinely spectacular, the cult that he inspired was largely a literary construct. His career clearly indicates that the future of French sport was as much in the hands of the sportswriters as those of the athletes themselves. In this too Rozet was prescient. Two years after his Défense et illustration de la race française, Rozet wrote an essay called “L’Avenir de la littérature sportive” (“The Future of Athletic Literature”). In it, he describes the emergence of a new genre, a way of writing about sports that differed from anything that had been done before. In his earlier book, Rozet had promoted the burgeoning French interest in sports; in this slightly later essay, he argues that it is not enough for a culture to practice sports or even succeed at them, but that that success must be celebrated in serious literature as well. Rozet frames the question that interests him very clearly in the opening paragraph of the essay. Little by little, he says, sports have “invaded our daily lives.” But in order for sports to take their place alongside genuinely significant “national activities” such as art and literature, there will have to be an “athletic literature” as well as athletic contests. Rozet seems optimistic about the possibilities. Already he sees the beginnings, however hesitant, of such a transformation. The very fact that illustrious poets, prose-writers, humorists and academics have begun to write about “muscular life,” in some cases on the front pages of sporting periodicals, suggests that some sort of rapprochement is taking place between hommes de lettres and the world of muscle. However, Rozet opines, in many cases the results cannot be considered examples of true “athletic literature.” Many of them, in fact, are nothing more than accounts of reactions, on the part of “intelligent men of letters,” to “the spectacle, viewed exclusively from the outside, of athletic effort.” When a man of letters writes about a sporting event, it is often as something that is by definition alien to his experience and about which he knows little. This very novelty is often his central theme. True athletic literature, by contrast, must be genuinely grounded in athletic knowledge. Rozet argues that in order to understand sports and thus describe them properly, you have to have had some first-hand experience of athletic competition or training: “You don’t watch a boxing match the way you do a sunset […] an athletic description must be above all, by a sort of muscular sympathy, a ‘physiological state,’” (3) There is, he says, a “second generation” of writers who have in fact had some athletic experience, however little, and have spent some real time among athletes of one sort or another. These “storytellers” (Rozet makes a point of using the word) are in a much better position to create a true athletic literature. Their works are informed by a sound and detailed technical understanding of the sport about which they are writing, while at the same time being more than merely technical accounts. Legions of boxing writers have sprung up, some of them writing only “communiqués” from ringside or purely commercial hype to help promote a bout. Others, however, sometimes in those same articles, find in boxing “a bubbling source of descriptive style, humor, eloquence.” There is plenty of uninteresting writing about boxing, Rozet says, but the sport also regularly inspires examples of the kind of athletic literature he envisages for the future. It is very important to note that Rozet’s examples not only display sound technical knowledge and literary style but also what he calls “moral considerations, […] comparisons with extra-athletic life, intended to illuminate […].” Specifically, both examples display a preoccupation with the way in which Carpentier serves as a standard-bearer of Frenchness; both pose, by way of Carpentier’s example, questions about French identity. In the first, the author pays homage to Carpentier as a sort of savior of the French “race,” to whom all Frenchmen are indebted. In the second, the author speaks of the centrality of style and esthetics to French tastes, even in something as rough as a boxing match. The sort of “panache” he calls for is something that Carpentier reliably provided (except when a rough-and-tumble opponent like Papke made it impossible to do so). Underlying Rozet’s discussion of athletic literature, then, is the notion that it is intertwined in some way with French identity. The kind of “lyricism” Guasco says Frenchmen like to see in the ring is directly comparable to the lyricism Rozet wants to see in sports writing. Dry, business-like reporting of the facts is equivalent to the fighting style, at once brutal and methodical, of a boxer like the American Papke; Frenchmen require something more esthetic and meaningful, both in the ring and in the words used to describe what takes place there. At the same time, Rozet acknowledges, albeit in passing, the debt that the more literary French sportswriters owe to their Anglo-American counterparts. It is because they have paid careful attention to English and American newspapers and magazines, especially in their reporting on boxing, that French writers have developed a style of humor that recalls Dickens or Twain, “a delightful mélange of all genres.” French boxers had learned the basics of their profession by emulating their Anglo-Saxon counterparts; French sportswriters had done the same. Sports writing in periodicals may well have begun to rise to the level of Rozet’s imagined genre of athletic literature, but it was still not clear if and when poems, plays or novels representing athletics will appear. One factor, Rozet says, is that readers are not yet sufficiently knowledgeable, indeed not yet sufficiently athletic, to greet such literary works with enthusiasm. What is needed is an author who will do for athletic literature what Pierre Loti did for travel literature. Perhaps one day, Rozet hopes, there will be an athletic equivalent of Zola’s cycle of novels, a “Rougon-Macquart of the world of muscle,” but that day has not yet arrived. He does cite two authors who are clearly already taking important steps in the right direction. 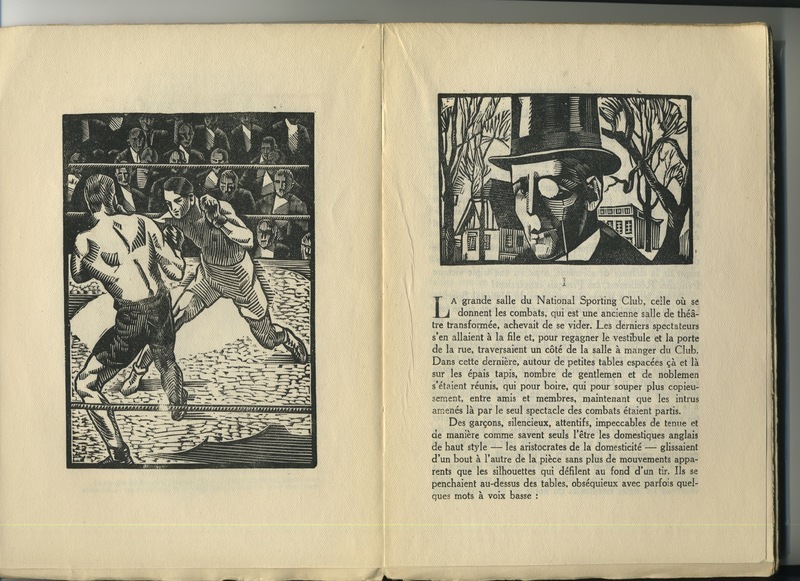 Tristan Bernard’s recent novel Nicolas Bergère: Joies et déconvenues d’un jeune boxeur (1911) demonstrates a genuinely athletic perspective, as well as a sociological realism—directly attributable to the large amounts of time its author has spent in the company of boxers and race-car drivers. Rozet also cites one of Louis Hémon’s short stories, praising the fact that Hémon’s descriptions of the bodies of boxers are at once anatomically precise and literarily interesting and reminding his readers us that descriptions of the human form hark back to the Greeks. With their new-found knowledge and appreciation of the body, specifically the body in movement, writers of the twentieth-century athletic renaissance could end up creating “a more sincere or at least more complete humanism” than that of the sixteenth-century cultural Renaissance, the concerns of which were “almost exclusively contemplative and formal.” What Rozet could not know was that, at the very time he was writing, his compatriot Louis Hémon was writing a novel of precisely the type he was calling for. It would not be published until more than decade later, but, like Rozet’s own work, it demonstrates an uncanny prescience about the man who would very soon become France’s longed-for athletic Messiah. Georges Carpentier would fulfill Hémon’s fantasy of a French champion boxer; Hémon himself would fulfill Rozet’s fantasy of a Frenchman who could write a novel about sports that was both technically accurate and stylistically worthy, who could thus bring into being a true athletic literature. 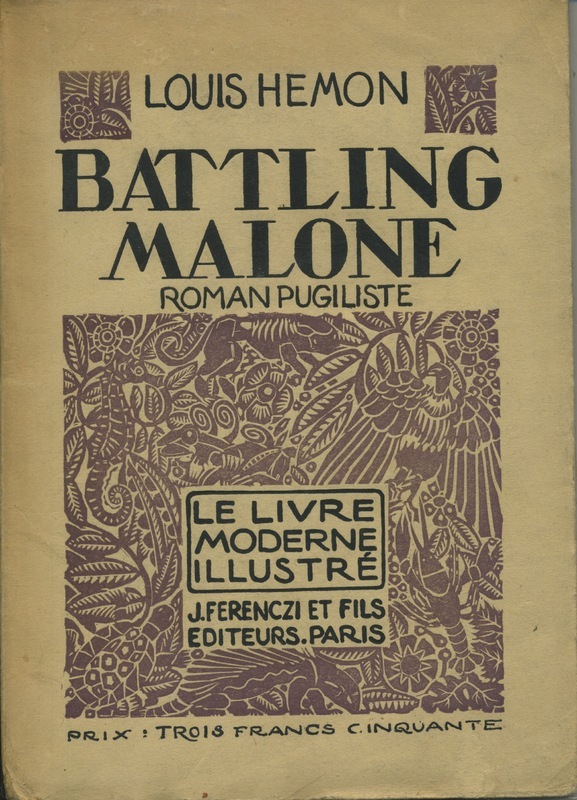 Louis Hémon’s Battling Malone is widely considered a forerunner of what would eventually be a substantial body of French literature devoted to athletic themes. It is not possible to establish a definitive date of the writing of Hémon’s novel, which was not published until 1925, some twelve years after his death. We do know that it had to have been written before Hémon sailed from Liverpool for Canada in October 1911, since the manuscript was found in a trunk he sent to his family in France before his departure. Hémon indeed anticipates Carpentier’s future triumphs in the ring against British opponents in several weight classes, up to and including heavyweight. His novel thus creates a fictional Carpentier of the future; he paints a portrait of Carpentier as the champion he hopes he will become, as the champion his fellow Frenchmen needed him to be. Carpentier’s pre-October 1911 record may well have sparked Hémon’s imagination but the writer and sports fan had no way of knowing that his fantasies would be realized. The story of Hémon’s novel Battling Malone is both simple and compelling. In order to reverse a recent and deeply unsettling trend of British boxers’ losing to French opponents, Lord Westmount and a group of friends from the National Sporting Club form the “British Champion Research Syndicate,” whose sole purpose is to find a British boxer able to restore national honor in the ring. Westmount eventually comes up with Patrick Malone, an East Ender of Irish heritage with an unusually massive and powerful physique and a talent for brawling. Malone possesses virtually no pugilistic skill or technique but an iron jaw and fists like sledgehammers have made it possible for him to devastate more skilled opponents. The “syndicate” decides that Malone will avenge England’s honor by beating the Frenchman Jean Serrurier, the “pugilistic marvel of the decade, before whom so all the middleweights of England and America had had to lower their flags.” (59) Before long, Malone becomes the darling of the British newspapermen and is acclaimed as a national hero. Eventually, the fight with the prodigious Frenchman takes place, a classic David-and-Goliath, skill-vs.-brawn matchup. British bluster notwithstanding, the science of pugilism wins out in the end and Malone is decisively defeated. Malone’s humiliating loss in the ring also means the loss of the woman he loves, Lady Hailsham (Lord Westmount’s sister), who greets his post-fight declaration of love with derisive laughter. In a melodramatic and rather gruesome conclusion, the simple-minded brute Malone avances threateningly toward the cruel Lady Hailsham, who shoots him dead. “Do you think he can beat Serrurier?” asked one voice and everyone strained to hear the answer. This was the answer they had wanted to hear, and they all stood back up with a flame of pleasure in their eyes. Finally, Old England would reign supreme again, and they would be able to pick back up and slip back into the vanity of a superior race, like a piece of clothing that had only been out of fashion for a few months! They turned to look at Patrick Malone as if to a new Messiah, all of them having dropped for a moment their imperturbable calm and that aristocratic coolness that has been inculcated in them at Eton and Oxford as the only attitude befitting men of their station and country. After years of suffering through an endless stream stories in which red-blooded Englishmen physically humiliate lily-livered Frenchmen, Hémon was finally able to write the ending he wanted, in which a skilled, intelligent, gentlemanly Frenchman overcomes, through a stylish application of the art of boxing, an English brute. Even before Carpentier had proved his real worth in the ring, the image was already in place (at least in Hémon’s mind) of a slim, handsome, golden-haired French boxer with exquisite manners and devastating ring prowess, able to defeat larger and tougher opponents through sheer technique. These things would come to pass many times in the years to come—in England, in fact, most notably with Carpentier’s defeats of British heavyweight champs Billy Wells in 1913 and Joe Beckett in 1919 and 1923. At the time of the writing of Battling Malone circa 1910, however, they were more wishful thinking than anything else. Faithful French sports fans, perhaps including Hémon, may have believed that Carpentier was the man who would prove French prowess and manliness in the face of English derision but that was still, before October 1911, largely a leap of faith. The history of the evolution of sports in France, especially in the 1870-1914 period, is a complex one, with profound implications, and has been the object of much study by social and cultural historians. Among others, see: Paul Adam, ed. Le Sport à la une, 1870-1914 (Paris: L. Levi, S. Messinger, 1984); Michel Caillat, Sport et civilisation: histoire et critique d’un phénomène de masse (Paris: L’Harmattan, 1996); Jean Toussaint Fieschi, Histoire du sport français de 1870 à nos jours (Paris: PAC, 1983); Ronald Hubscher, Jean Durry, and Bernard Jeu, eds. L’Histoire en mouvements: le sport dans la société française (XIXe-XXe siècle) (Paris: Armand Colin, 1992); and Philippe Tétart, ed. Histoire du sport en France 2 vols. (Paris: Musée National du Sport: Vuibert, 2007). Louis Hémon, “Anglomanie,” Journal de l’automobile, February 4, 1905. Reprinted in Hémon, Récits sportifs (Alma: Editions du Royaume, 1982), 107-108. Cited in Bouchard, 173. The information conveyed here concerning Hémon and the writing of Battling Malone is derived from Bouchard. In addition to the literary settling of the pugilistic score between the English and the French that is Battling Malone, Hémon also wrote a short story dramatizing the defeat of an English boxer by a Frenchman. “The Frenchman,” the sixth in a collection of short stories set in an English boxing gym (“Chronicles of the Cadgers’ Club”), tells of the day a Frenchman shows up in the gym and puts on the gloves with one of the regulars of the establishment. The English boxers are at first puzzled and amused by the very idea of a boxing Frenchman, then perturbed, not knowing what to expect. What begins as a friendly sparring session becomes a real fight and the gym members are shocked and chagrined to see their fellow Englishman knocked out by the visiting Frenchman. Their entire world-view has been revolutionized: “Alf Plimmer beaten by a Frenchman!…A Frenchman!… It was the end of everything; the ancient dogmas were bankrupt; the hierarchy of the world had crumbled; it was the distressing spectacle of a God suddenly behaving aberrantly, blessing the infidels…” The story was originally published in L’Auto, March 15, 1910, p. 1; it has been reproduced in Louis Hémon, Récits sportifs (Alma, Québec: Les Editions du Royaume, 1982), 159-162.